At Stamford American, our vision is to inspire students to create their unique future… academically, socially and as ecologically literate citizens in our culturally diverse world. Our students not only have the opportunity to choose a sought after education pathway to help realize their academic ambitions, they are also provided with life skills reflective of the IB Learner Profile as adaptive, thoughtful and principled young adults, with a fostered inclination to design, innovate, problem solve and communicate. 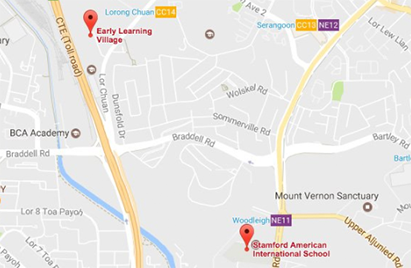 Stamford American International School (SAIS) in Singapore offers the full International Baccalaureate (IB) Programme integrated with US Standards, combined with the College Board’s Advanced Placement (AP) courses. We look forward to welcoming you to our global community. Inspired by Reggio Emilia philosophy, the Early Learning Village is built on the simple truth that the environment nurtures the child. The Village is a first-of-its kind for young learners age 2 months to 6 years (Infant care to Kindergarten 2). We are proudly an International Baccalaureate (IB) World School, aligned to the U.S. American Education Reaches Out (AERO) standards with a choice of multiple pathways for admissions to leading universities worldwide. Combining best teaching and the finest facilities, our Athletics and Co-Curricular Activities (CCAs) Program aims to provide equal sporting opportunities for all ages while developing athletes to reach their fullest potential. We combine a passion for drama and music with our world-class facilities such as 500-seat professional theater and 10 annual theater productions to nurture and achieve the best from your aspiring actor or director. 2 Oct 2018 - As a complete student-led initiative, students from Stamford American has collaborated with Sun Electric and installed new solar panels. The project started in October 2017 with 2 student, Jonathan and Mark, from the Green Lions Club. 19 Jul 2018 - Congratulations to the Class of 2018! We graduated 82 High School Students at a beautiful ceremony on Saturday, 2 June 2018. Meaningful learning experiences begin with the love of learning. A love of learning is neither innate nor something that can be taught. Celebrating home traditions helps you and your children stay grounded in your own culture while you are all adapting to living in a new one. The Secret to Fitting in Family Time! Work, school, the gym, extracurricular activities, social obligations, play dates, medical appointments... the list goes on and on. Stamford American’s Early Learning Village is architecturally designed for children from 2 months to 6 years. Reggio Emilia inspired, it provides sensorial learning at every turn. Stamford American's campus design has been led by an ambition to achieve an educational environment that provides the greatest opportunity for students. Stamford American students considering a university education in the U.S. are privileged to have easy access to the very best information and advice, right here on campus.